The library map is one of my most used tools at the Reference Desk. Prospective students and their families take copies as they pass through on tour, students and professors utilizing the library from other schools use it to find their way around, freshman locate quiet spaces to study and almost every student who comes to the desk for a Reference Interview leaves with an annotated library map. It was from these scrawled map notes — full of highlighter, arrows and call numbers — that I began to rethink how the map could better serve library patrons. So much of what the library has to offer students and professors is hidden behind a necessary veil of organization, however this organization tends to lead to an obstructive curtain of abstraction. My goals with the redesign of the map was to ‘un-code’ the library collection by creating visual and textual entrance points for users. This primarily entailed adding subject headings by call number to the new map key and also the creation of a color coding system. You might notice that the subject headings are not all Library of Congress subject headings, instead some of the headings were changed to reflect the courses of study available at St. Francis. Additionally, many students study both nutrition (health promotion) and sports medicine, so these two divided sections were visually connected by the same color. Other simplifications included the removal of ephemeral or highly detailed information that did not pertain to the physical collection. 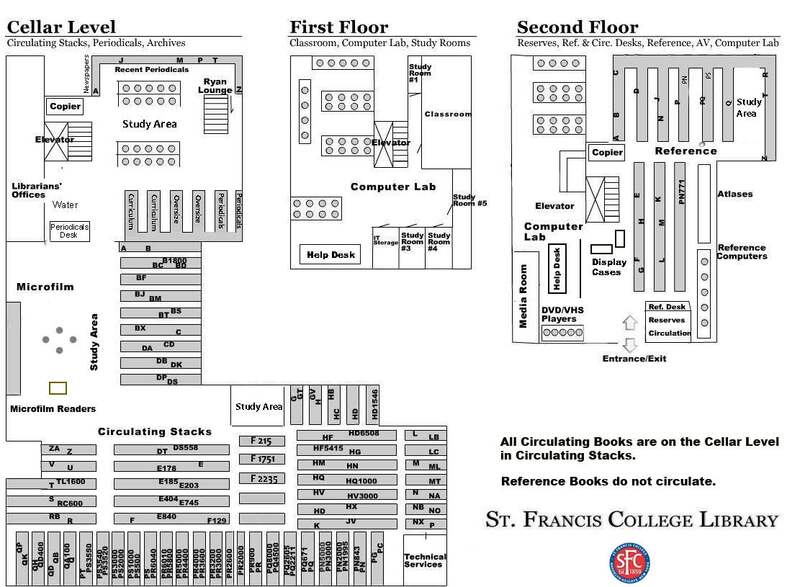 Individual tables (which often move throughout the semester) as well as computers were eliminated from the map. 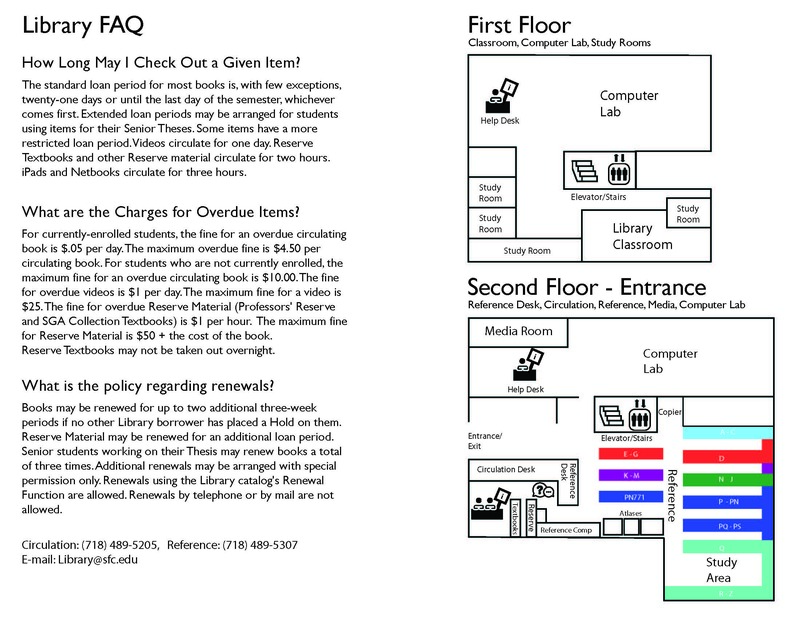 Additionally, locations where students can receive help or assistance were united using icons and all three floors of the library were rotated to face north. This rotation caused the map to spill off onto the back of the page, a happy accident that allowed for a space to answer some frequently asked questions regarding library policy. 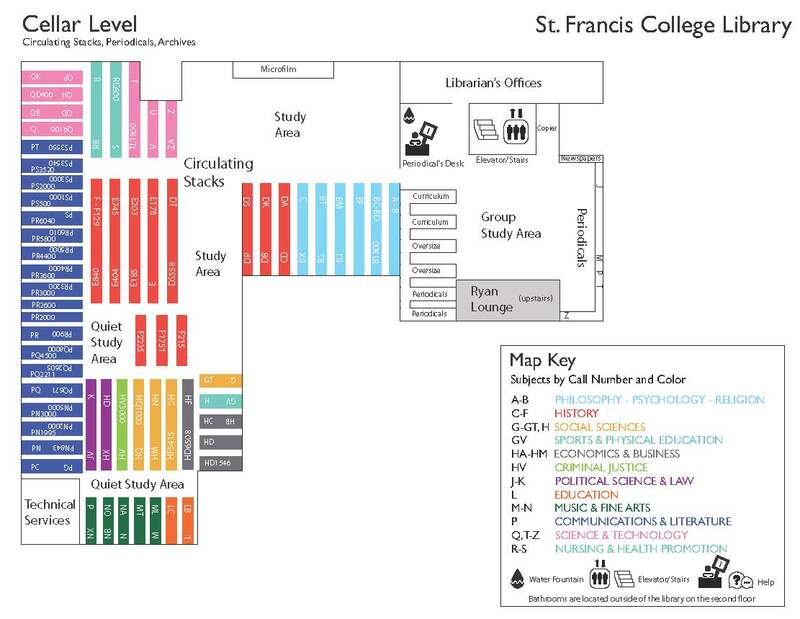 Although this project began with the redesign of the library map, I then collaborated with one of the librarians to redo all of the library’s stack signage, utilizing the same color-coded subject headings as the map — a project that I’ll post more about later on this month. Continuing on with future projects, the redesigning of the library map in Adobe Illustrator has now opened up the possibility of creating ‘personalized’ maps for the catalog system, which would utilize the vector images to create finding paths and circle book locations, similar to the Map it @ WSU project, should the library decide that they are interested in utilizing this technology. One of my favorite parts of working with such a dedicated and small team of librarians is that everyone is open to trying something new, changing the way things work and getting their hands dirty! Working on these mapping and signage summer projects has been a great way to synthesize a lot of my feelings about libraries as physical spaces and the importance of user friendly design. Even as a part-time librarian and a library student, looking at the new map and hanging up new signage made me realize the insane practicality and beauty of the cataloging system. Ideas, like books that hold them, are connected. They are citizens of subject areas and time periods, all of which are constantly being added to with new publications. The library floor plan is in it’s own way a conversation. When the internet can give you definitions of all shapes and sizes, the library can still offer students, professors (and even aspiring librarians) a space for discovery and happenstance. Where on the internet there is a certain absolution, in the library there is still an organized continuum.